Introducing a one-stop resource for several invasive plant species in Wisconsin! Visit our story map to view distribution maps, links to identification information, and a priority species list for your county. In the story map, click on your county to view a priority species list. 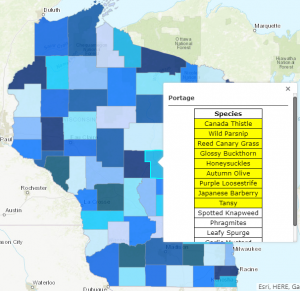 Read the sidebar on the map to learn about high priority (yellow-highlighted) species.